FULTON – Fresh on the heels of the roll out of Dolly Parton’s Imagination Library, the Fulton City School District has bolstered its literacy promotion efforts to include on-the-go reading opportunities. “Books on Buses” is a new initiative with the Fulton City School District, which puts books in the hand of children as they ride to and from school. 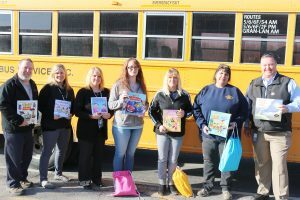 The project was gladly supported by, from left: FCSD Transportation Supervisor Greg Henrie, Granby school-home liaison Amy Kunzwiler, Granby Principal Gina Salerno, bus drivers Renatta Hill, Candice Anthony and Deb Wilder, and Golden Sun Bus Service President Patrick Kinane. Together, FCSD and Brooke’s Books Project piloted a program which provides free books to children on Fulton City School District bus routes. Increased access to age-appropriate books, reading opportunities, vocabulary recognition, phonetic skills practice, and social-emotional bonding with potential buddy reading systems, among other efforts, are available through the new program. “Books on Buses” has been implemented in a slow roll out with a few bus routes at Granby Elementary School and will, ideally, expand to include more Granby bus routes before moving on to bus routes from FCSD’s other elementary schools. The program is also available for students who utilize smaller buses and van transportation. Brooke’s Books Project has partnered with the Fulton City School District before to offer free books during the district’s 2018-2019 school supply distribution event. Brooke’s Books Project is supported by the Literacy Coalition of Oswego County and the Weston T. Hyde Educational Foundation, and is run by Brooke Trevett, an 11-year-old fifth grader in the Oswego City School District. Trevett said she has a continued desire to share her love of reading and that is exactly what the Fulton City School District has aimed to share with its families. Salerno echoed that sentiment and said she is grateful “Books on Buses” is available to several Granby students. When the program was announced at school, Salerno said the student body became excited. She, the students and Golden sun bus drivers are all thrilled to see the program grow.